"Peronism led a process of expanding economic equality, collective organization and political enfranchisement. Trumpism, by contrast, builds upon American tendencies toward inequality, individualism and political disengagement." 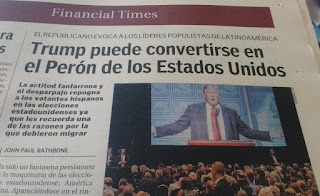 Financial times: Una columna del diario británico conservador Financial Times comparó al candidato a presidente de Estados Unidos, Donald Trump, con el mandatario argentino Juan Domingo Perón. "Trump puede convertirse en el Perón de los Estados Unidos", afirma este matutino dedicado a las financias y la economía. 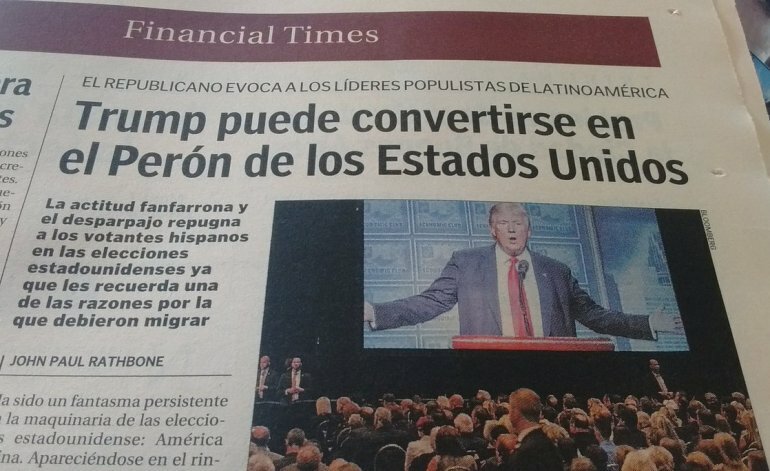 "Cuando Trump se pavonea con toda la fanfarroneada parece haber salido de un espantoso pasaje de la historia latinoamericana. Dicen que a veces comparte rasgos de hombres fuertes populistas como el dominicano Rafael Trujillo, o los argentinos Domingo Perón y Carlos Menem", analiza el Financial Times. Comparing Trump to South American authoritarians reveals a dangerous misunderstanding of democracy. Such comparisons fundamentally misunderstand Latin American populism. It's en vogue for enraged liberals to compare Trumpism to Argentine Peronism, wielding the analogy as a warning about the potential apocalypse that they fear is about to engulf us. Most recently it was Larry Summers, a member of the Democratic establishment for decades, who took to Twitter to declare: "I worry about the Argentinization of US government." Summers sent the tweet after President Trump accused Democrats of treason and the media reported on the president's childish wishes for a military parade. He employed a standard characterization of Peronism as an authoritarian movement, a familiar depiction that no doubt had many Americans nodding along. It's not only Democrats who treat Peronism as the poster child for dangerous authoritarianism. In April 2009, Rush Limbaugh weighed in on the imminent government bailout of General Motors and Chrysler: "The president of the United States, Barack Perón, will announce his Argentinian-like takeover of Chrysler." 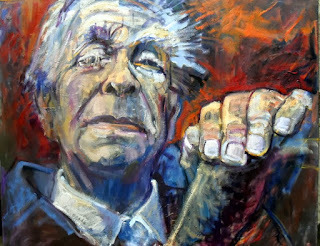 Even more thoughtful scholars have recently argued that "Perón shows how Trump could destroy our democracy without tearing it down." Like so many familiar historical cliches, however, this one is incomplete, if not downright wrong. It ignores that the core of Peronism was a vision that is the exact opposite of Trumpism. Peronism led a process of expanding economic equality, collective organization and political enfranchisement. Trumpism, by contrast, builds upon American tendencies toward inequality, individualism and political disengagement. In fact, the comparison reveals more about Democrats than about Trump. Although the more liberal party, Democrats prioritize safeguarding liberal institutions over advancing policy goals such as greater economic equality. In fact, they equate many efforts to achieve these goals — such as Peronism — with dangerous authoritarianism. Peronism, and movements like it, undoubtedly remake society and politics, from ideas to institutions. But such challenges pose less of a threat to democracy than the Democratic tendency to deify political institutions and safeguard them at all costs — including sacrificing underlying principles such as fairness, justice and equality. Juan Perón presided over a process of massive wealth redistribution on behalf of the emerging working classes. In alliance with a mobilized labor movement, his government increased its intervention in the economy and provided goods and services to its members, including free public health care and education for everyone, as well as a wide array of union-managed social services. Peronism enacted strong regulations on private capital and secured labor protections and workers' rights in the union shop. By the late 1940s, more than 80 percent of workers labored under a system of collective bargaining, and labor's share of national income rose above 50 percent— a landmark in Argentine history. At a time in which war battered the global economy, the daily caloric intake of Argentine workers was around 3,000 calories, second only to the United States. Argentina under Perón also experienced a process of massive political enfranchisement. Women voted at the national level for the first time in 1952, and labor activists became ambassadors, members of congress and cabinet officers. Argentina's social transformations resembled in some ways those that took place in the United States during the New Deal. Perón certainly thought so: The speech closing his presidential campaign in 1946 quoted entire paragraphs from President Franklin Roosevelt's second inaugural address. And so, ironically, did the many American policymakers and business executives, who consistently invoked the specter of Peronism as an argument in favor of dismantling the New Deal, and as a dark example of government intervention in the economy and union involvement in politics. The idea of social rights drove these changes in Argentina. Peronism and other populist movements in postwar Latin America claimed that the political rights and welfare of economically disadvantaged groups had been frustrated by economic elites. Because of that, they were entitled to specific benefits and protections as a "class" — above and beyond the individual rights of citizens — so its members could exert the same level of influence in society that others wielded individually. Since no individual worker could exert as much influence as a businessman, unions enabled workers to collectively achieve the same kind of access and influence others had by virtue of their economic power. True, Peronism pushed the boundaries of democratic institutions, used coercion and violence against its opponents and created a toxic political environment, suffocated with images of Perón and his wife Eva as redeemers of the Argentine working class. Perón undoubtedly used the government to control unions and exert undue influence over the media. But Peronism paid a high price for these actions, suffocating the democratic dynamics it had helped to create and contributing to its own undoing. Perhaps more importantly, the violence of the 1940s and 1950s under Perón was minimal when compared with the fierce attacks against organized workers that preceded it. And it paled in comparison to the repressive efforts to erase all traces of Peronism afterward, including the state-sponsored terrorism of the military dictatorship in power from 1976 to 1983, terrorism waged in the name of "eradicating Marxist and Populist aggression." What does this have to do with Trump? Little, if anything. During his first year in power, Trumpism has been consistent in its efforts to ease labor regulations, weaken unions and extol the benefits of giving a free ride to big business. Above all, what makes Trumpism so different from Peronism is the correlation between declining union power and growing inequality in the United States — the exact reverse of what brought Perón to power. A ferocious, decades-long assault from business has left union power in America declining since the 1950s. Membership and bargaining power have reached historical lows: 11.5 percent of wage earners are unionized and 13 percent are covered by collective bargaining agreements. The lack of representation for workers, not their empowerment, propelled Trump's success. Trump's victory built upon the crucial 2011 Republican victory in Wisconsin that curtailed collective bargaining rights for most public employees. Such efforts continued to weaken the ailing relationship between Democrats and unions in Rust Belt states, where the Obama administration's economic policies, as Joseph Stiglitz and others warned, resulted in a slowed-down and unequal recovery. Trumpism, and the racist undertones of its agenda, prospers in this climate of economic inequality and political deafness to building demands for economic equality. Along with huge tax cuts for the wealthy, Trump's administration has steamrolled workers at every turn, including the aggressive dismantling of regulatory agencies, the revision of legislation and precedents favoring workers' rights, and an overall approach favoring big business and discouraging labor organizing. Which makes Summers's comparison of Trumpism to Peronism deeply problematic: It ignores how in fundamental ways the two are polar opposites, and it embraces a definition of democracy and freedom that prioritizes institutions above all else. This orientation — with its blind spot toward popular demands — provided an opening for Trump's authoritarian prescriptions and his assault on the very constituency boosted by Peronism: the working class and the poor. Instead of fearing Latin American populism, maybe, as political scientist Thea Riofrancos has suggested, Democrats should look to it as offering a potential path forward for a more equal and fair country. Only by embracing instead of dismissing collective claims for dignity and questioning the existing order will the country be able to confront Trumpism and the causes of Trump's rise to power. Ernesto Semán is assistant professor at the University of Richmond and author of "Ambassadors of the Working Class: Argentina's International Labor Activists and Cold War Democracy in the Americas."